You want the best house you can get, with an interesting, family-friendly layout, an attractive exterior, and nice finishes – without blowing up your budget. But if you get heavily invested (emotionally and financially) in a design before you have a handle on new home construction costs, you’ll end up cutting costs at the very end of the process, resulting in an unsatisfying, stripped-down house. Controlling costs early on isn’t just about how much you spend on finishes, it’s about size and complexity, too. Many things affect the cost of building a typical house but there are three big ones: size, complexity, and the level of finish. Keeping to a budget means finding a balance between the three; unless your budget is unlimited, too much of one means not enough of the other. In other words, to stay within a certain budget, a too big house might mean a house with cheap finishes. As you’re thinking about the design, consider the “big three” things below – how they rank in importance to you, and how they might impact the cost of your project. The effect of house size on construction cost is obvious – bigger houses cost more. But it’s not quite that simple. More important than house size alone is the matter of where that size goes, since the “cost per square foot” of a house varies tremendously from room to room. It’s obvious that a kitchen, with appliances, cabinets, countertops, plumbing fixtures, tile flooring, and other expensive finishes will cost more “per square foot” to build than a bedroom – which doesn’t have much more finish than carpeting and paint. If you squeeze the size of a house down by taking space from low cost-per-square-foot rooms like bedrooms you’ll find that you haven’t affected the overall cost of the house much at all. In fact, you’ll likely not do much more than simply raise the cost per square foot of the entire (now smaller) house – and maybe not change the overall cost at all. So a smaller house – if the size difference is in inexpensive rooms – may not be a less expensive house. The effect of the complexity of a house on the construction cost is frequently misunderstood – and it’s one of the sources of many an unpleasant surprise for house plan buyers. Simply put, a complex house is more expensive to build than a simple house. But what makes a house “complex”? In part, it’s a function of the shape of the house and the relationship of the amount of roof and the amount of foundation to the area of the house. Consider two typical house designs: A rectangular two-story Colonial house and a French Country home with a first-floor master bedroom suite. Both houses are 3,000 square feet and both have the same level of finish. The Colonial home is the picture of simplicity; both floors are exactly the same size and are stacked directly over another. So while the entire house is 3,000 square feet, the foundation and the roof are each only 1,500 square feet (I’m ignoring the garage for this example). It’s efficient and easy to build. The French County design is the same size but less efficient; with the master bedroom suite moved from the upper floor to the lower, the roof area and foundation area increase by about 500 square feet. The overall size of the house, however, stays the same at 3,000 square feet. More roof and more foundation containing the same area – the house is the same size but with more lumber and concrete, the cost goes up. Complexity is also about the design, details, and “constructability” of the roof. Colonial homes usually have simple gabled roofs. In the simplest examples the roof is made entirely with just one truss configuration. That’s a huge sigh of relief for the truss fabricator and the framing crew – every truss is the same! And without any intersecting roofs or dormers, there’s no overlay framing and no flashing or valley metal to install. But French Country design is distinguished by its more “rambling” nature; an attractive home of this style spreads itself out a bit. French County roofs are typically hipped rather than gabled (hips are more expensive) and are often steeply pitched – more lumber is required and the roofing labor is more expensive. 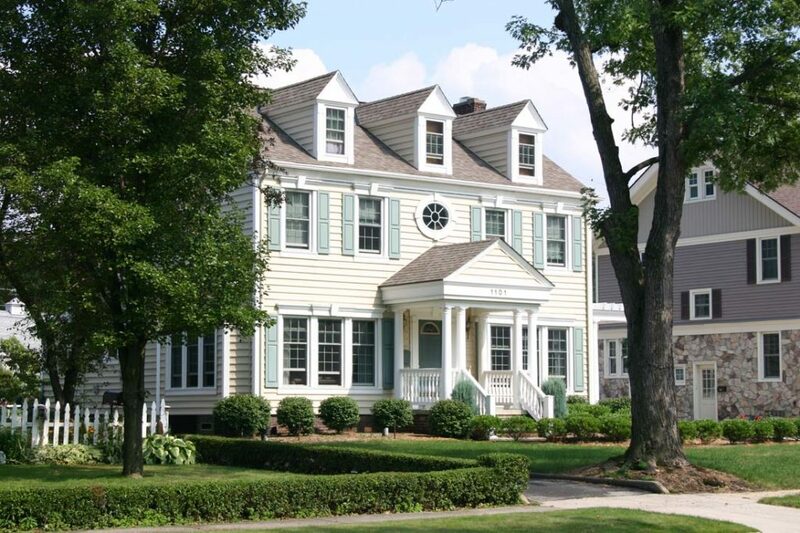 Every angle, intersecting roof, bay window, porch, or level change adds complexity to a house. If you’re evaluating several house design ideas, look for complexities in the layout that may make one significantly more expensive to build than the other. Remember that we’re talking about two houses that are the exact same size, but a difference in complexity makes in a big difference in cost. If your new home dreams include a complex and expensive “shell”, will you have enough money in the budget for the nice finishes you want? Let’s compare two houses again, only this time they’re both identical 3,000 square foot Colonials. One has a fiberglass tub in the master bath (about $500) and one has a very nice whirlpool tub (maybe $5000). That one change adds $4500 to the cost of the house but more importantly, it changes the overall “square foot” cost of the house by almost $1.50 per square foot. Careful – here’s where new homebuyers start getting “nickeled and dimed” to death. Finishes and fixtures (flooring, cabinets, countertops, trim, etc.) represent about 30% to 40% of the cost of a house. You may only increase the cost of each item a little but because so many items fall into this category it’s very easy to lose control of the total cost. If you want nicer finishes but your budget is tight, put the nice stuff in the kitchen and master bath and the cheaper stuff everywhere else. More importantly, assemble a list of the finishes and fixtures you want at the beginning of the project and stick to it. On any project, start with a clear idea of the level of finish and quality you expect. Don’t assume that your builder is in tune with your ideas about finishes – discuss your expectations in detail and whenever possible, see the actual finishes and fixtures. If you’re not the detail-oriented type, hire a professional interior designer. Finally, always have realistic expectations about your project budget and communicate that budget to whoever’s designing and building your house. When everyone understands the project’s financial goals the chances for success are greatly increased.